8-4. By all accounts an up and down season. Perhaps some optimism but in general most fans are not completely satisfied. There’s a general feeling of mediocrity, underachievement, and that things must improve. Welcome to modern day Oregon football. For historical perspective, in 1990, the Ducks went 8-3 and went to the Freedom Bowl in Anaheim, CA. Fans were elated. At the time, this represented the pinnacle of Oregon football for an entire generation. QB Bill Musgrave was already an Oregon legend who had built upon the mid-80’s foundation laid by Coach Rich Brooks and another local Sheldon kid named Chris Miller. Dallas Warmack takes up space. Of course, the Ducks went on to lose to Colorado State in the bowl game to finish 8-4, Musgrave graduated, and Duck fans were collectively scared going into 1991. The general thought was “how can we win without Musgrave?” These thoughts proved prophetic, as the Ducks flipped their record to 3-8 that season. Indeed, the sky was falling. Thankfully, in 2018, it’s not. The Ducks are a national brand. They have money, facilities, a top-notch recruiting class, and enough current talent that falling to something like 3-8 just won’t happen. Being disappointed at 8-4 is a healthy thing, not a greedy thing. I had to write this opening to this article as an exercise in maintaining my sanity and perspective as a Duck fan. I predicted a 10-2 season. I feel with better offensive scheming, play-calling, and charisma that the Ducks would have gotten to 10-2. Especially when you consider the weak schedule and a weak conference. Not to mention having the best quarterback in the country. But damn it, things don’t always go the way they should! For me, blowing out the Beavers means very little. Of course, it’s always great to beat our in-state rival, but from a purely football perspective, this game was no different than any of the three cream-puffs the Ducks played to open the season. Though I believe Jonathan Smith is laying a good foundation in Corvallis, as of right now, the Beavers flat-out stink. By far the worst team in a weak Pac-12. 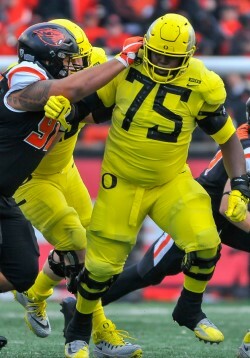 1) Physicality: The Ducks are strong and beefy up front. In particular, they looked superb in the Stanford and Washington games. The biggest weakness that was exposed when the Ducks were national title contenders appears on its way to getting fixed. Thomas Graham Jr. has fun in the end-zone. 2) Recruiting, Recruiting, and Recruiting: Mario Cristobal can flat-out recruit. All major recruiting outlets have them in the top 5 (if not the top 3) for the 2019 recruiting cycle. If they land Kayvon Thibodeaux, the No. 1 overall recruit, cover your eyes because the champagne bottles will be popping (Thibodeaux announces on December 15th). 3) Cristobal, CEO: Cristobal seems to have all the intangibles of good college football coach. Honesty, integrity, personality, likability, charisma, and of course the recruiting chops. Creating a “family” environment is common theme heard among players and recruits. That is critically important. 1) Offense: Boring and predictable. Former coach Nick Aliotti continually commented on how he knew what the Ducks were going to do. And if he knew what they were going to do, then obviously opposing defensive coordinators who’ve watched hours of tape know what they were going to do. To be clear, this isn’t a call for things to go back to what they were in the Chip-Helf days, but creativity and gamesmanship on offense is a must. Even Alabama runs a more wide-open offense than the Ducks. If it’s good enough for Saban, it’s gotta’ be good enough for Oregon. 2) Defense: The defense made vast improvement in 2017 and everyone was expecting further improvement this year. It didn’t happen. In fact, the Oregon defense took a step backwards. No doubt, Jim Leavitt is a very good DC, which make this even more puzzling. 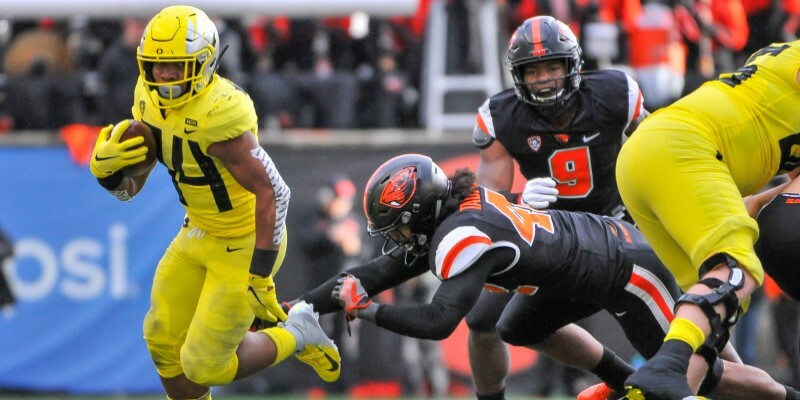 The Ducks often inept offense didn’t do the team’s defense any favors in 2018, but too many blown plays, missed assignments, containment issues, and poor tackling was prevalent this season. 3) Justin Herbert: Hard to believe he’s on the “bad” side of the list. But the fact is, Herbert was inconsistent this season. Some of that is on him, some of it is on the coaches. If you believe in the concept of “coaching a player up,” then you must also believe the opposite. The Ducks took a potential Heisman contender and turned him into a mediocre college quarterback who too often lacked rhythm, confidence, and swagger. I firmly believe that Herbert was coached down this year. Travis Dye off to the races. The Ducks have a month to prepare for a bowl game. They need to come out guns blazing on offense. 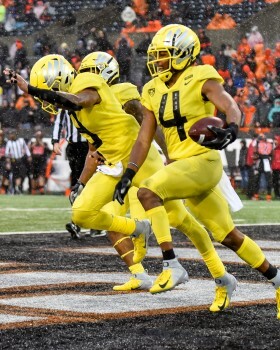 If, from start to finish, the offense resembles what we saw in the first half against Arizona State, then an argument could be made that the Ducks are finally executing Cristobal’s current vision for the offense and will be looking to build upon this solid effort for next year. If this game resembles anything from this year’s somber WSU, Arizona, or Utah games, then serious concerns will haunt the Ducks in the off-season. The positive thing is that from bad could come good. If the offense is completely inept and out of sync, it may make things very easy for Cristobal to decide to go a different direction with the offense. Whether that means coaching changes (Arroyo), instilling a whole new offensive philosophy, or both. The goal for the bowl game, win or lose, needs to be making it clear which direction the offense needs to go. Any direction that reeks of wishful thinking and smells of “maybe, kinda’, sorta’, hopefully…” must be immediately vetoed. The direction the offense should goes needs to be made with the certainty of going for it on fourth-down and goal when you’re down by six points with only three seconds left in the game.